If you’re anything like me, your bathtub is one of the most beloved objects in your home. Nothing beats finishing off a rough day like slipping beneath the surface of a warm bath and soaking your troubles away. However, your relaxing paradise can easily turn into your worst nightmare if not treated with proper care. Water damage and mold can sneak up on even the most pampered of bathtubs, and can cause serious damage to your home if not caught and repaired quickly. Here are a few things you need to know about identifying water damage risks. Spotting the tell-tale beginnings of leaks in your bathroom is the first and more important step. While some signs of water damage are obvious, such as flooding, there are some smaller signs you will also need to look out for. Softness and discoloration in your bathtub walls – If the tiles or plaster around your tub or shower show signs of distortion such as soft denting, blistering, or warping, this could mean there is water trapped behind the wall. If you have gaps in your grout or caulk, shower spray or bath water may be seeping into the walls and subfloor. Dripping faucets – Even a small drip you hardly notice could be a symptom of a larger problem. There could be a crack or a loose valve in your pipes that could lead to serious internal water damage in your home. Sluggish drains – If water struggles to escape down the drain in your bathtub or sink, this means there is a blockage slowing down the disposal. While this could be simply be caused by hair gathering in the drain and can just as easily be fixed with a basic filter or chemical cleaner, if left untended blocked drains can cause a buildup of pressure and bacteria in the pipes, leading to mold growth and pipe bursts. Mold and mildew – Mold growing around your faucet or the rim of your tub is a sign of serious moisture problems and lack of proper ventilation in your bathroom. Bathtubs and showers are havens for mildew because of the dampness and humidity, which can make it difficult to treat once the mold starts to spread. If any of the signs above continue to be neglected, you could be facing more than just annoying wet floors. Here are a few examples of the ramifications of ignoring early water damage. Bacteria and mold growth – Like I mentioned before, mold has the horrible habit of thriving in the moisture of your bathtub. Bacteria and mold is not a pretty sight and can cause serious health problems for you and your family. It’s important to get this taken care of immediately to avoid spreading and potential health risks. Ruined floors – Particularly if you have wood floors in your bathroom, moisture and hidden leaks can cause your floors to warp and rot. The floor might feel soft and spongy in places, and if left untreated could cause the entire flooring system under your bathroom to collapse. Structural damage to your home – Whether it’s in the floors, in the walls, or in the ceiling if your bathroom is on the second story, water damage from leaking pipes or overflowing tubs will eventually lead to wood rot, which weakens the structural stability of your house. Worst-case scenario: if the damage is severe the entire structure could collapse, sending you beloved bathtub, shower, sink, and toilet crashing to the floor below. Water damage in your tub and bathroom is not a terminal problem if treated with the proper care. Here are a few things you can do to hopefully avoid these problems, and what to do if you notice the damage starting to occur. Use shower curtains and doors – This will help you avoid water spilling onto the floor. Bathmats are also a great way to keep from dripping water all over the bathroom once you finish relaxing in the tub. Don’t mess with your flood guard – Never cover or disengage the flood guard drain if your bathtub or sink comes equipped with one. These won’t completely stop flooding from happening, but it will greatly diminish the possibility of it getting out of hand if you step away for too long while the tub is filling up. Call us! 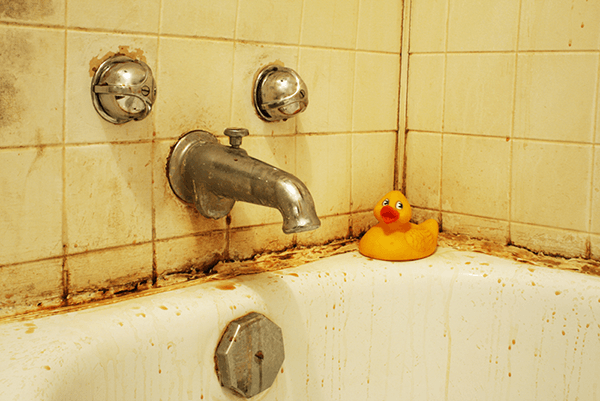 – Our water, mold, and fire damage experts are available 24/7 to help restore your bathroom and tub to its former glory if you are ever affected by leaking pipes or mildew growth. We believe everyone deserves to have a Fresh Start and we want to make sure you can get back to soaking your worries away as soon as possible! Call us at (877) 488-7988 for your Fresh Start! For more information, check out our Customer’s Guide to Water Damage.